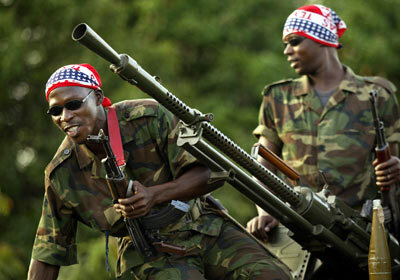 Justice in Conflicts: What’s all the Fuss About? When I first found this blog, weeks before becoming a regular author, I was excited. I thought it covered an angle of the transitional justice debate that had so far been neglected, and I would like to take the time to elaborate that point in this post. I believe that the application of international criminal law in conflicts is a trend that will be with us for the decades to come. The implications of this development may be enormous, and I believe that the potentially far-reaching consequences have so far not gotten the attention they deserve by academics and practitioners alike. For those who have been working on questions of transitional justice for some time, this statement might seem a bit grandiose. After all there is a long history of national trials and amnesties implemented during conflicts. Nicaragua tried a number of rebels for crimes against humanity between 1983 and 1988 while its bloody civil war was still ongoing and the Philippines tried members of its military in 1988 and 1990 during its conflict with the Communist Party of the Philippines, to just name two examples. But the trend of transitional justice moving into conflicts can be demonstrated both in figures as well as in statements made by stakeholders. The Transitional Justice Database compiled by Prof. Payne, Andrew Reiter and Tricia Olsen includes all transitional justice measures implemented worldwide between 1970 and 2007. If we have a look at the trials conducted in the context of conflicts, we find a steadily increasing number, particularly starting in the early 90s. While 17 trials were carried out in conflict contexts between 1972 and 1991, 34 were initiated between 1992 and 2007 alone. At the same time, the share of international and hybrid trials amongst the total number of trials conducted in conflicts is increasing. 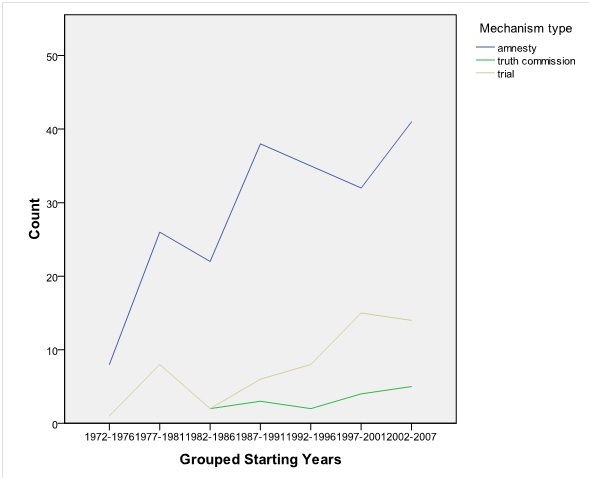 This graph shows the number of transitional justice mechanisms applied in conflict context. The share of trials is increasing. Arguably, the tendency to try crimes committed in conflicts is part of a broader trend to intervene in cases in which states fail to protect their citizens. The so-called Responsibility to Protect (R2P) was adopted at a High-level Plenary Meeting of the General Assembly in September 2005. 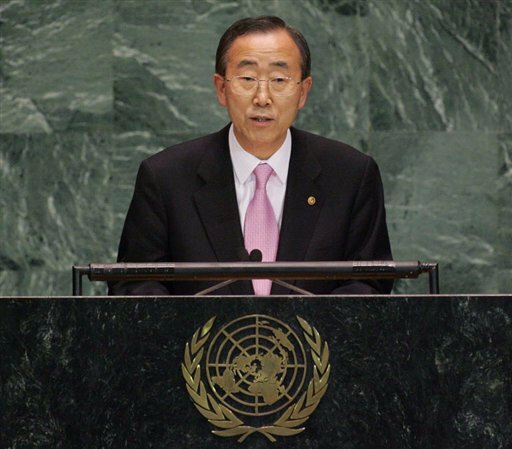 In his 2009 report on R2P UN Secretary-General Ban ki Moon made clear that the UN endorses measures short of military interventions in cases in which the R2P applies: ‘It would be neither sound morality, nor wise policy, to limit the world’s options to watching the slaughter of innocents or to send in the marines. The magnitude of these […] crimes and violations demands early, preventive steps […].’ The UN Security Council referrals of the situations in Darfur and Libya to the ICC as well as the creation of the Special Tribunal for Lebanon have shown that international criminal justice interventions are part of this toolbox. Several posts in this blog have shown that the decision-making process in bringing atrocities during conflicts to book is still flawed and selective. Still, the recent ICC investigations of crimes committed during the conflicts in Libya and Côte d’Ivoire show that the trend is stable. As pointed out initially, this trend has potentially huge repercussions for conflict resolution efforts. So far, little is known about the effects that investigations by international criminal tribunals and courts have on conflicts. Despite this lack of knowledge, institutions like the International Criminal Tribunal for the Former Yugoslavia (ICTY) and the ICC have taken up their work in conflict contexts. Opinions and general observations on the performance of courts and tribunals abound, while experts are increasingly criticising that in-depth empirical research is lacking. All the while, the system of applying international criminal law in conflicts has definitely entered its practice phase. Questions that call for our urgent attention are posed by this new development. Can quick and resolved legal reactions to human rights abuses in conflicts help to end them faster or to stop them from escalating as advocates of international criminal justice would suggest? Can the indictment of leaders committing atrocities help to isolate them from their sponsors and external supporters? Can international criminal law deter atrocities in ongoing conflicts? All of these issues are aiming at the million dollar question: Can transitional justice in conflicts further conflict resolution efforts? Of course a blog cannot answer these questions. JiC is more about raising the right questions. Still I felt that this was a valuable contribution to the debate when I first stumbled across the blog and I hope that some of our readers today share this opinion. This entry was posted in Justice, Peace Processes, Peacebuilding, Responsibiltiy to Protect (R2P), Transitional Justice, UN Security Council, Uncategorized, War crimes. Bookmark the permalink. 1 Response to Justice in Conflicts: What’s all the Fuss About? This is a really great post and I am very appreciative of you posting it. I do, however, have one question about semantic/terminology. You employ the phrase “transitional justice in conflict”. I have seen it before, including in a UN report. Isn’t it a contradiction in terms? I think the reason that more attention should be paid to “justice in conflict” is precisely because it is *not* “transitional”. There is no transition when and where these mechanisms are put in place. Indeed, what they may do is to help precipitate a transition which makes them much more interventionary than transitional. At the very least, it is worth thinking about whether the terminology of “transitional justice in conflict” actually occludes what “transition” means – and just as importantly, what states are supposed to transition to.